In this little catcapade, Babson slinks through the lives of fraternal twins, Vanessa (Nessa) an Vance. Nessa has a terrible fall, leaving her comatose. Vance rushes to her side, convinced it wasn't an accident and someone had it in for his sister. He plots to go undercover as Nessa (he's her twin and a female impersonator) and see who hated her so much. With the doctor's help and the story of amnesia, Vance appears to be successful, until he meets Gloriana, Nessa's cat (which also happens to be Vance's stage name). Vance is introduced to the rest of the house, which provides a very interesting mix of characters and soon discovers almost everyone had it in for Nessa for one reason or another. Slowly, but surely, Vance unravels the whole charade, including his own, and finds out what really happened to Nessa. 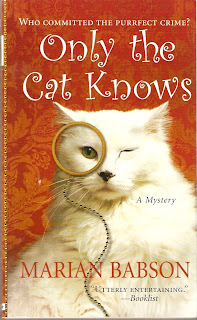 I don't know why I'm drawn to these stories, perhaps it's because of the cats. The storyline is preposterous and the setting ridiculous, but Babson pulls it off; it's almost like pulp noir in reverse. She manages to get the reader across the Suspension Bridge of Disbelief and is quite clever in her mystery, I didn't get who was the culprit until the end. She makes the storyline work. So far, Babson's books are great distractions, but, then again, I do like cats and she writes them well. Did you know that you can create short urls with OUO and get money from every click on your short urls.